My observations as to why this happens follow. The delay happens because the company has to see too many candidates before they can figure out who is right for the job. To me, this is the number one reason that it takes too long to make a new hire. If jobs are not properly specified and defined, if issues are not spelled out, it is virtually impossible to know who the right candidate is. I have actually had management tell me to send a variety of people because when they meet the right person they will know him or her. This is no way to hire. And it often results in a bad hire. Creating Proper job specs is essential. Sadly, most companies don’t know how to write a job spec. The bottom line is that once written, if a candidate is rejected for any reason and that reason is not part of the job description, then the spec needs to be rewritten. Hiring managers ought to have the confidence to know the right candidate when they meet him or her. They need to trust their recruiters and their human resources professionals to send them appropriate people. Seeing too many candidates makes for confusion and delays the process, often necessitating the candidates seen early in the process to have to be re-interviewed. Worse, the process may take so long that interested candidates continue to interview and often get other job offers. This means the original company has to start all over again. Over thinking leads to paralysis. Sometimes hiring managers get too caught up on the wrong issues. Over thinking the job creates its own confusion. There is one simple and overriding issue: Can a candidate do the job? Sometimes hiring managers who do not know how to interview or judge candidates really get caught up in their underwear. They raise issues which may or not be evident or relevant: will the candidate stay for several years (is that required to actually do the job? ); is this job a stepping-stone to something else (does it matter? ); will the candidate's family life take precedence over work (should this really be an issue?). Many issues can be answered if references are asked appropriate and probing questions. Few companies formalize the way they interview. If a candidate has to meet three managers plus human resources, those people should discuss the candidate prior to each interview. Mostly, what happens is that all three managers will simply meet the candidate and ask their own questions based on their individual perceptions of the job. Instead, each interview should have a syllabus and agenda. Issues raised in one interview should be covered again in other interviews. Each person along the way should know what they are looking for and what the possible issues are. And again, everyone needs to be on the same page when it comes to what they are looking for. The president of a great agency properly rejected an account director candidate because that candidate did not have enough gravitas to fill in for the group account director if that person was unavailable for an important meeting. I thought that was very fair criteria. Sadly, no one in the interviewing stream knew that was what they should be looking for. It resulted in a lot of wasted time. Often, even CEO’s don’t have the full authority to hire even very junior people – they have to get approval from their CFO’s or, if the job is senior enough, from their holding company. I have seen it take two to three weeks to get approval to hire once a candidate has been chosen. At one agency, it takes six approvals just to start looking to hire; once a candidate has been identified, it takes the same six people to approve the hire. If the candidate is very senior (over $200k) it may take an additional number of people at the holding company level to approve. This pre and post process can add as much as eight to ten weeks to the process. I have one friend at a well known agency who told me that even the simplest, most junior hires can take as much as four months. If you are a candidate and expect to be hired, it can take days or weeks to get the final sign-offs to make the offer. Some delay can be intentional. Remember – a $120,000 a year employee costs the company $10,000 per month plus benefits. Delaying the hiring decision by even a month can put tens of thousands of dollars right to the bottom line. There are all kinds of recruiters. I receive comments all the time about others, many of whom are my competitors. A good recruiter must maintain a delicate balance between the clients who pay them and the candidates who support them. It is evident from many of the comments I receive that some recruiters really are only looking out for themselves and will do anything to make a placement. That is a short term strategy. A good recruiter will never lie to either his or her candidates or clients. It just doesn’t pay. Negative word of mouth can kill a business. Some time ago a candidate received an offer from a wonderful ad agency, through us. At the same time, he received an offer from an agency where he had been freelancing; he had been working for a terrible person with a justly deserved poor reputation, but his boss had not yet revealed her true self. He told the recruiter he was working with, that, after all, the other job where he was now freelancing would pay a few thousand dollars more and had the promise of a big bonus. The recruiter warned him about the reputation of the person he would be working for. He was warned that if he accepted the job, he would not last long enough to collect a bonus – several people had previously served in this job and none had lasted more than a few months. (I will never understand how companies keep department heads like that, but that is for another post.). The recruiter even told the candidate to ask others in the industry about the people he would be working for. All to no avail. Our candidate would have loved the other job and, the compay really, really wanted him and went out of its way to show him how much they liked him - their offer went way higher than the original job specifications. The recruiter tried to tell the candidate that he was making a serious mistake by turning this job down. But I think our candidate really thought we were only trying to talk him into accepting the job that came through us. Barely a couple of weeks into his new full time job, we received a surprise email from the candidate asking if the first job was still available (of course it wasn’t). He was man enough to admit that we were right and that he could not bear his boss. For his sake, I was sorry to hear the news, but not surprised. He actually apologized for not listening. The lesson in this story is that if you find a trustworthy recruiter with an impeccable reputation, who thoroughly knows the business, you should listen carefully to what they tell you. And if they tell you to go to other sources to check out what they are telling you, you can believe they are telling the truth. Why It Is Hard For Foreigners To Work In the U.S.? Most of my readers are Americans. But many of you know people who are foreign nationals who want to work here. Please pass this information to them. Despite the plethora of worldwide agencies, it is very difficult to obtain work in the United States, even for employees of those agencies. In many cases, some companies, as a matter of form, simply ignore people with foreign credentials (they even discount Americans who have worked abroad), even those from their own offices abroad..
Foreign nationals face a double whammy when they move or want to move here. First, agency people are reluctant to do the paperwork necessary to obtain visas. Second, and possibly more important, because the U.S. is geographically isolated and many of us are infrequently exposed to people with advertising training in other countries, so there is a built in prejudice against foreigners.. One HR person commented to me that people from other countries don't know U.S. media. That is laughable since anyone in the business under forty years old has not been intimately involved with U.S. media operations since the media companies became separated from the general agencies. Most people who work in Europe or Asia are constantly exposed to people from other nations; they know that people assimilate and learn quickly. Advertising is not a complicated business and the principals are the same throughout the world. In the United States, we do somewhat better with with English speaking people – people from the U.K., South Africa, Australia and New Zealand. But we are often adverse to others, no matter how well they speak English. Almost every day I receive résumés from people throughout the world. I can honestly say that some of them are wonderful and might make a great contribution to American companies, but few will get a chance. American ad agencies reject most of them out of hand. Case in point: I recently interviewed a wonderful person from Singapore. She had worked for one of the major international ad agencies, spoke perfect English and had absolutely stellar CPG credentials. Her husband was transferred here so she was totally eligible to work in the United States with minimum paperwork. The woman from Singapore had been highly recommended to the U.S. office of her former employer. She contacted the New York office, which had received the references, and the human resources person, despite the excellent recommendation, wouldn’t give her an interview; she was told to keep checking back with their web site to see if any appropriate jobs were posted. I thought that was shameful. HR could have done the courtesy and found a half an hour for an interview. Had she called her former CEO, she probably could have gotten him to get her an interview, but she was reluctant to call in the favor. There is no question that visa applications are a pain. No one likes to do them. But when the talent is good, the extra work may be well worthwhile. In this business, talent trumps everything else. Most of the people here with working visas, initially got American jobs either through transfers or knew a senior executive who was able to champion their candidacy for employment here. Sadly, there are actually several ad agencies which have instructed recruiters not to submit anyone who requires sponsorship of any kind. I can honestly say that in all my years of recruiting, I have only been able to place one foreign national here in an initial U.S. job. Other recruiters tell me the same. This even applies to Canadians and Mexicans who are eligible to work here under NAFTA; however it is somewhat easier to place a Canadian (I have placed several). The truth is, many big city ad agencies don’t even want to interview Americans from another U.S. city. The issue in recruiting (and hiring) is always talent. We put square pegs in square holes and there should be no issue if someone has lived and worked somewhere else. I suspect one of this issues, particularly in New York, Los Angeles or Chicago, is that we are snobs and cannot believe that an advertising person from somewhere else might actually be qualified or know more than someone home grown. Ironically, once a foreign national has their first U.S. job, it is somewhat easier for them to transfer visas and move to another company. I have placed many of them who simply required a visa transfer; but even doing that, with proven talent, some agencies are reluctant. My heart goes out to people who come here and want to work here but find it really difficult. Many years ago, my dad, also Paul, ran a successful advertising agency. Gumbinner-North was the twentieth largest agency in the world. My dad had wonderful insights into the business. Once I had achieved some prominence in the industry, he warned me that, and I am quoting, “Fees will be the death of the agency business as we know it.” He couldn’t have been more right. One of the many issues with fees is that it puts clients in charge of their own business. Part of what agencies should be paid for is their objectivity. But with fees, clients have the last word. One of the manifestations of this is clients who insist on meeting candidates who will work on their account prior to their being hired by the ad agency. (Or, worse, agencies who do it out of fear and volunteer to have clients interview prospective hires for their accounts). This is alarmingly common, especially with senior executives, but I have seen account executives and account supervisors who have been forced to meet with their prospective clients prior to being offered a job. Some agencies have told me that this is a courtesy and the clients do not have the right of approval. That is BS and unlikely - an agency is hardly going to make the hire if, for some reason, the client does not like the potential employee or has negative comments: “Oops, sorry, we are going to hire her/him anyway.” Wrong. By having the client meet the potential employee prior to hire is giving he client tacit approval to control every action which the agency makes on the client's business, no matter how significant or trivial. I can think of one instance where a group account director was interviewed by a client. The interview went well. 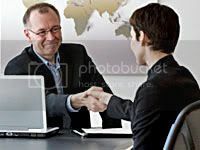 But at the end of the interview, the client called the agency and told them that since they were paying a fee, they felt that they didn't need someone that senior running their business; they instructed the agency to find someone more junior. As appalling as this is, it actually happened. Gosh, dad, you were right. Agencies are always in the best position to know who they need and who will succeed. Presumably, after interviewing multiple candidates and with much experience with the client, they are in a position to determine the ideal staffing on their accounts. This is not a shared responsibility. By giving clients the ability to meet prospective candidates, agencies not only lose their objectivity, but they end up in the difficult position of being totally beholden to the client. What happens if the person ends up being liked by the client but not by the agency? How do you tell your client that the person is not doing a good job? The reverse is a lot easier: if the hire turns out to be a dud, it is a lot easier to tell the client who has not approved them that a mistake was made. When an agency hires an executive at any level it should be with total confidence, enthusiasm and absolute support. Clients should always know and trust that the agency has their best interest at heart. Period. When clients interview agency executives, it puts the client/agency relationship in perspective; and not a good one, either.